Today is one of the most unanticipated Fed statement days in recent memory. How will we ever survive without hearing that “today is the most important Fed day ever”? I say that because absolutely nothing is really expected today. Chairman Jay Powell did his 170 degree turn earlier this year and the Fed is now on a new course. Okay. Maybe, I am exaggerating a little bit. Perhaps, we will hear about their plans to end their sale of bonds purchased during their Quantitative Easing programs, but that should be about it. Financial markets have ripped since Powell’s embarrassing mea culpa in early January with stocks and bonds sharply higher. Crude oil is also up significantly and the dollar is marginally higher. Gold is basically flat. As with every Fed statement day, 90% of the time stocks stay in a plus or minus .50% range until 2pm before the fireworks take place. That should be the case today as well. After that, we usually see strength into the close roughly 75% of the time. That trend has been muted today after Tuesday’s action. However, there may be a less frequent and negative trend setting up for after the Fed which would call for lower prices in the very short-term. The FOMC is absolutely not going to touch interest rates today nor at their next few meetings either. They are effectively on hold until further notice and the odds favor the next move to be a rate cut. Besides Powell and the rest of the FOMC doing an about face in early January, a few very important pieces of economic news have surfaced lately. None come as a surprise. First, the European Central Bank cut their annual GDP forecast from 1.7% to 1.1%. As I have written about before, for all intents and purposes, Germany and Italy are already in recession. Second, China’s economy continues to surely and steadily weaken. Finally, the February employment report in the U.S. was wildly weak although I feel fairly confident that it is going to be revised sharply higher. Although the Fed’s dual mandate calls for maximum employment and price stability, I do not believe they can ignore what’s going on around the world. The global economy is soft. Continuing to raise interest rates here would certainly have detrimental effects on growth as well as likely strengthen our currency. Neither would be considered good for the global economy. Right now, Goldilocks is alive and well and residing in the U.S. economy. Not too hot. Not too cold. The Fed would be backed into a corner if the U.S. economy re-accelerated again without Europe and China following suit. That would force Powell to raise rates and hasten recession. Speaking of recession, I stand by my forecast from 2018 that the U.S. will see a mild recession beginning between Q3 2019 and Q3 2020 although I would happily be proven wrong. Economic data is decelerating. I believe we have seen the trough in weekly jobless claims along with the peak monthly new jobs created. Housing has been a challenge for some time and that does not appear to be changing any time soon. Credit cards delinquencies are spiking and auto loans, especially from millennials, are a big problem. Don’t get me wrong. The economy is not teetering on recession. I just listed the problems. GDP is still growing, coming off a 3.1% year with 2% likely in 2019. Wage growth is the best in many years and money is flowing back to our shores. It’s going to take time for all this to wear off and some external shock to hit. One thing I know for sure. Powell and the Fed will not forecast the next recession. Why? Because the Fed has never, ever, ever once correctly predicted recession in the U.S. or really anywhere for that matter. You could say that they are perfect in their incompetence. You could also argue that secretly they really do see problems coming down the road, but could never telegraph that publicly for fear of upsetting the markets. This is the argument I fall on the floor laughing my head off. The Fed is always late. Had they started the rate hike cycle earlier or the asset sales, they could have avoided conducting them concurrently. I have said this from day one and never wavered; what the Fed was trying to do is like landing a 747 on I-95. It’s technically possible, but so beyond likely to be successful. In fact, as I have stated many times, it has created a fertile landscape to grow recession. This time, the pomposity has been taken to new heights by adding the program of what’s been labeled Quantitative Tightening. The Fed is now selling the securities in the open market that they purchased during Quantitative Easing. These sales are effectively interest rate hikes by themselves. The markets and economy cannot withstand the Fed conducting both. And although the rate hike cycle appears to have ended, the damage has been done. Normally, I send out a very detailed update when the Federal Reserve concludes their every 6 week meeting. Given the volume of updates I have published lately, I am sure most of you have a little Paul Schatz fatigue. So for someone not known for brevity as my colleague,Renee, says all the time, I am going to keep this short and to the point and then work on a very important Canaries in the Coal Mine. The Fed concludes their two-day meeting today with the statement released at 2 pm est. Jay Powell and company are not going to raise short-term interest rates today. In the statement, I do expect them to remain hawkish and set the table for another rate hike at their final meeting of 2018 next month. The economy continues to grow and perform very well over the past five quarters with an incredibly strong employment report from October that included 250,000 new jobs, a 50 year low in U-3 unemployment and annual wage growth over 3%. That’s about as good as it gets. Tax reform and deregulation are certainly working economically. With all that said, nothing has changed in my forecast for a mild and consumer-driven recession beginning between Q3 2019 and Q3 2020. The Fed’s DNA will be all over it. Right now, I am concerned about auto loans and credit card delinquencies as well as mortgage rates. The housing market is softening or outright turning down. Some dismiss that because tax reform is hurting states with high state and local taxes. I don’t like to qualify data. For whatever reason, something is wrong in housing. The stock market model for today for today is to see stocks trade between plus and minus .50% until 2pm and then a rally. However, with the huge move over the past 7 days, that trend has been muted to but a coin flip. There is a chance to see a negative trend develop for the next few days, but I need to see where stocks close today. Finally (see I can be brief! ), I wanted to show you the last time the day after a mid-term had such a huge move. You had to go all the way back to Ronald Reagan, my favorite modern day president, in 1982 when stocks soared 4% after the GOP lost House seats but gained a Senate seat. 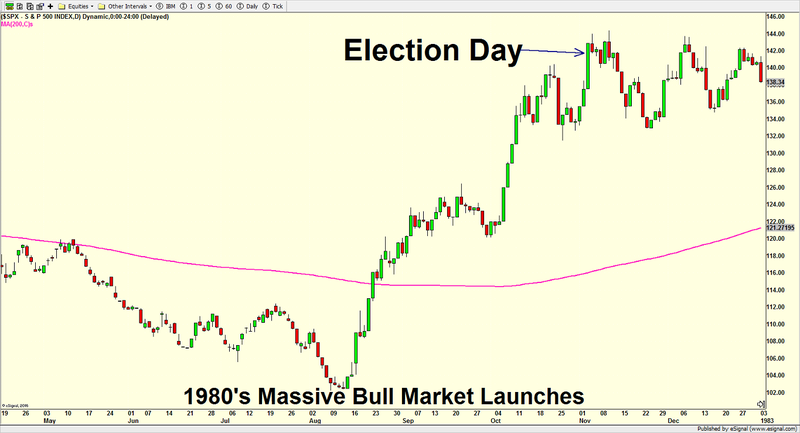 What happened back then is very different from now as August 1982 was the dawning of the great 1980s bull market after a 14 year slumber. Sentiment was close to an all-time low. Few owned stocks or even cared. I am sticking by my bold forecast that if stocks race right back to new highs, the bull market that began in 2009 will end in Q1 2019. More on this next week when I publish the long awaited Canaries in the Coal Mine. As with every Federal Open Market Committee (FOMC) statement day, there is a model for the stock market to follow pre and post announcement. Certain environments have very strong tendencies while others do not. Over the past few meetings, many of the strongest trends were muted and today looks a lot like the August 1 meeting day. I drew arrows below so you can see what the S&P 500 looked like heading into the Fed’s statement day which is today. In both cases, stocks were just off of their highs. In August, stocks rallied and declined before beginning another leg higher. I wouldn’t be at all surprised if stocks saw a quick pullback this week followed by another rally attempt next week that ultimately fails. As with most statement days, the model for the day calls for stocks to return plus or minus 0.50% until 2:00 PM. There is a 90% chance that occurs. If the stock market opens outside of that range which seems very unlikely today, there is a strong trend to see stocks move in the opposite direction until 2:00 PM. For example, if the Dow opens down 1%, the model says to buy at the open and hold until at least 2:00 PM. There is a strong trend in play for stocks to rally on statement day and especially after 2 PM. After raising interest rates by 0.25% 6 weeks ago, Jay Powell and company will be at it again today by hiking rates another 0.25%. Markets have fully priced this in and have begun to price in another 0.25% at the last meeting of the year in December. This continues to fit perfectly within our forecast for 3.5 rates hikes in 2018 with the risk to the upside. All eyes and ears will be waiting for the Fed’s forecast of rate hikes in 2019 which now stands at two. Investors will also be parsing the statement and listening to the Powell Q& A session on the economic impact of tariffs and tax reform. While I doubt there will be much if any mention of the Fed’s sale of assets purchased during the Quantitative Easing programs, it should be noted that the pace of sales increases next month. That’s another potential drag on liquidity in the system that may take the markets some time to adjust to. Economically, things remain firm right now on the back of tax reform, reduced regulation and massive repatriation of corporate cash. We have strong Q2 GDP growth although Q3 will be much more challenging, record corporate profits, inflation back up in the zone and more jobs open than people to fill them. Consumer confidence and consumer sentiment are at or near record highs. Even wage growth is moving higher. Only the tariffs are holding back the economy and I think that may resolve itself favorably after the November elections. In many ways, it doesn’t get much better than this. Reread that last sentence. That’s the one that concerns me a little bit, not so much for the next few quarters, but certainly as we get into the middle of 2019. If it can’t get much better than this, it only has one way to go although recessions do not begin with data like this. It takes time for bad behavior to permeate the system and confidence to become exuberance, but we are close! Yes, with banks holding $2.5 trillion on their balance sheets, the recession should be mild and look nothing like 2007-2009. And yes, this expansion will be more than 10 years old. And yes, there will be some external trigger like 9-11 or the S&L Crisis to push the economy over. This time, it could be tariffs or a European banking crisis. But the Fed will have greased the skids sufficiently for the economy to recess. Below is a chart I have shown at least quarterly since 2008. With the exception of a brief period from mid 2009 to mid 2010, the velocity of money collapsed. It’s still too early to conclude, but it does look like it stopped going down in 2017 and might be just slightly starting to turn up as you can see on the second chart of M2V since 2008. If 2017 does turn out to be the bottom, this would also coincide with the bottom of the commodity cycle which I have discussed and should lead to a massive commodity boom over the coming decade, especially in the non-energy products. These two charts definitely speak to some structural problems in the financial system. Money is not getting turned over and desperately needs to. The economy has been suffering for many years and will not fully recover and function normally until money velocity rallies. This is one chart the Fed should be focused on all of the time. It would be interesting to see the impact if the Fed stopped paying banks for keeping reserves with the Fed. That could presumably force money out from the Fed and into loans or other performing assets. It continues to boggle my mind why no one called the Fed out on this and certainly not Powell so far at his quarterly press conferences. As with every Federal Open Market Committee (FOMC) statement day, there is a model for the stock market to follow pre and post announcement. Certain environments have very strong tendencies while others do not. Over the past few meetings, many of the strongest trends were muted but today is at least a little different. As with most statement days, the model for the day calls for stocks to return plus or minus 0.50% until 2:00 PM. There is a 90% chance that occurs. If the stock market opens outside of that range which seems very unlikely today, there is a strong trend to see stocks move in the opposite direction until 2:00 PM. For example, if the Dow opens down 1%, the model says to buy at the open and hold until at least 2:00 PM. Last meeting stocks rallied to their highest level in 50 days, thereby muting a strong trend. Today, we do not have the same regime. There is a strong trend in play for stocks to rally on statement day and especially after 2 PM. 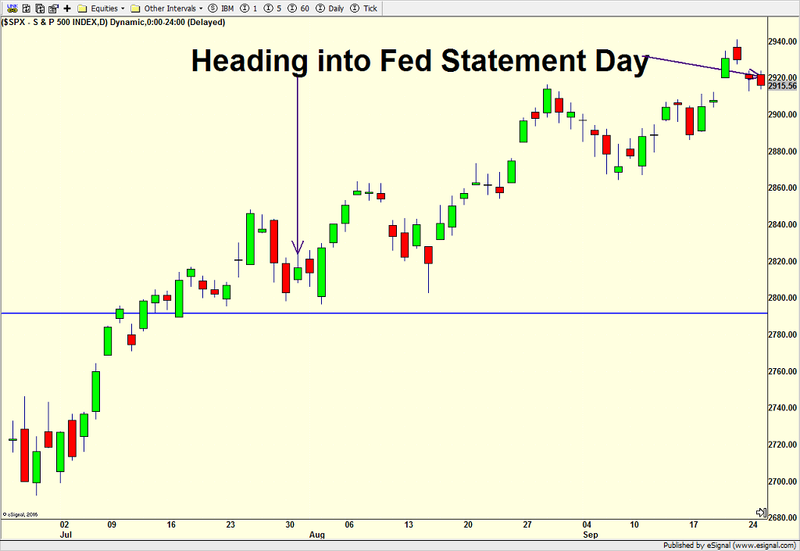 After the last meeting on June 13, I mentioned that a trend may be in play for stocks to decline. That trend ended up working out very well as the S&P 500 went from 2780 to 2700 in the two weeks after the meeting. That trend is very unlikely to be active after today. After raising interest rates by 0.25% 6 weeks ago, Jay Powell and company won’t be undertaking any action after today’s meeting. Markets will be paying very close attention to the statement released for clues about the Fed’s thinking for the rest of 2018. As I have mentioned all year, the likelihood is for four rates hikes this year with the next two coming in September and December. I just continue to chuckle and shake my head when I recall how many pundits changed their views to two or even a single rate hike when stocks were declining in February. They were better off just saying they didn’t have strong conviction rather than chase interest rates like lemmings. That’s the problem with the vast majority of analysts; they focus too much on what is currently happening and lose sight of the intermediate-term and the big picture. Then, they get amnesia and revise history to never be wrong. I have never had a problem standing by forecasts, even when I end up being wrong. It’s all part of the business. Some I get right with precision accuracy while others I have fall flat on my face. Get up, move on and learn. Economically, things are pretty firm right now with strong Q2 GDP growth, record corporate profits, inflation back up in the zone and more jobs open than people to fill them. Consumer confidence and consumer sentiment are at or near record highs. Only the tariffs are holding back the economy. In some way, it doesn’t get much better than this. Reread that last sentence. That’s the one that concerns me a little bit, not so much for the next few quarters, but certainly as we get into the middle of 2019. If it can’t get much better than this, it only has one way to go although recessions do not begin with data like this. It takes time for bad behavior to permeate the system and confidence to become exuberance. As with every Federal Open Market Committee (FOMC) statement day, there is a model for the stock market to follow pre and post announcement. Certain environments have very strong tendencies while others do not. Over the past few meetings, many of the strongest trends were muted and today is no different. With stocks rallying strongly and closing at the highest level in more than 50 days, the usual post 2:00 PM rally has been reduced to slightly more than a coin flip, not exactly the big edge we are used to trading. However, with this strength, an opportunity for a decline opens up depending on how stocks close today. The Fed is going to raise the Federal Funds Rate by 0.25% today. That’s almost 100% certain. Markets will be paying very close attention to the statement and Q&A from Chairman Jay Powell to glean what’s on their mind the rest of the year. With the usual Q1 sub-par GDP growth out of the way, Q2 and Q3 look to be much stronger. Additionally, May inflation numbers came in a little hot on both the consumer (CPI) and producer (PPI) side. With the PPI outpacing the CPI, companies are not able to fully pass along price increases to the consumer which is good for the consumer but not so good for companies who will see their margins squeezed somewhat. 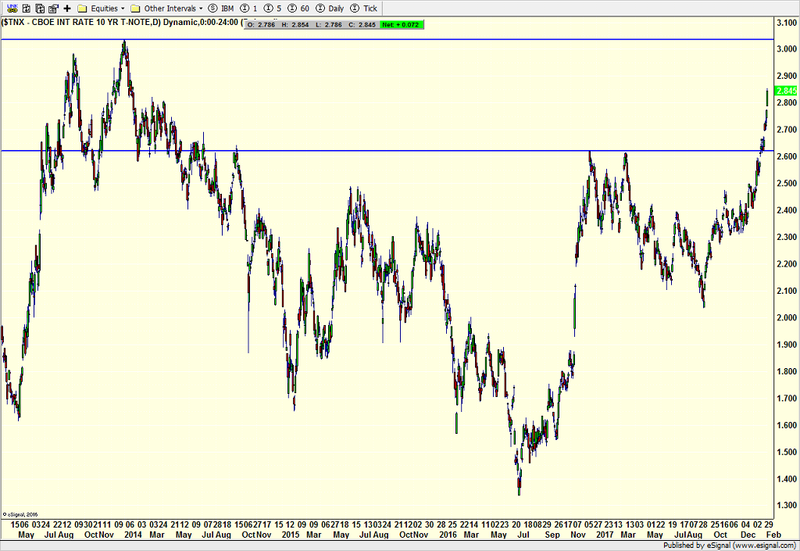 In turn, this could put some pressure on earnings down the road. Back in January, I forecast 3.5 rate hikes this year with the risk to the upside. I am standing by that and I haven’t wavered for even a day when the pundits were out in full force during the February stock market decline cutting their rate hike forecasts to just one more in 2018. That’s the problem with the vast majority of analysts; they focus too much on what is currently happening and lose sight of the intermediate-term and the big picture. Then, they get amnesia and revise history to never be wrong. I have never had a problem standing by forecasts, even when I end up being wrong. It’s all part of the business. Some I get with precision accuracy while others I have fallen flat on my face. Get up, move on and learn. Anyway, the likely scenario is another hike in September as well as December where I look for the Fed to begin patting themselves on the back for a job well done. It would be interesting to see the impact if the Fed stopped paying banks for keeping reserves with the Fed. That could presumably force money out from the Fed and into loans or other performing assets. It continues to boggle my mind why no one called the Fed out on this and certainly not Yellen at her quarterly press conferences. Hopefully, someone will question Chairman Powell on this today. As with every Federal Open Market Committee (FOMC) statement day, there is a model for the stock market to follow pre and post announcement. Certain environments have very strong tendencies while others do not. Over the past few meetings, many of the strongest trends muted although the system that said to sell on the close of the meeting hit a home run. The S&P immediately crashed from 2824 to 2645 or 6% during this quarter’s big market swoon. To be fair, although 6% was the return for the system, it certainly wasn’t due to the post-FOMC trend that the trade was based on. Sometimes, it’s better to be lucky than good! With stocks somewhat on the defensive lately, the next model calls for stocks to close higher today and rally after 2:00 PM. That is usually a very strong trend, 80%+, especially after seeing weakness into statement day (today). This is Chairman Jay Powell’s first meeting as chairman. History has shown that markets typically test newly confirmed chairs very early in their term and 2018 was no different as stocks immediately collapsed in early February as Powell assumed the reigns. The change from Yellen to Powell should be fairly seamless as their views were very much in line. I do not expect Powell to deviate much from Yellen’s course. As such, everyone is expecting another 1/4% rate hike today at 2 pm. In my 2018 Fearless Forecast, I called for 3.5 interest rate hikes by the Fed this year. With the data so far this year, I am sticking with that forecast with the risk to the upside, meaning that four or an outside shot at five hikes could be in the cards. After announcing their hike today, I also expect Powell et al to slightly upgrade their economic forecast, continuing to lay the groundwork for higher short-term interest rates. At the same time the Fed will forge ahead with their program to reduce the size of their massive balance sheet, accumulated through three rounds of quantitative easing. As I have said too many times to count, this experiment is going to end very badly. The Fed should have chosen one or the other. Hike rates or sell assets. Conducting both is an horrendous decision in my view. There is absolutely no doubt in my mind that recession is going to hit by the election of 2020. While it may be mild like we saw after 9-11, it will still hurt. And the Fed’s fingerprints will be all over this as they have before every single recession of the modern era. It seems like the Fed just can’t help themselves. They are destined to screw up economic expansions. Of course, there is always some external final catalyst like the financial crisis, 9-11, S&L crisis, etc. However, the Fed has always been hiking rates right into those events, long after common sense dictated a pause. It would be interesting to see the impact if the Fed stopped paying banks for keeping reserves with the Fed. That could presumably force money out from the Fed and into loans or other performing assets. It continues to boggle my mind why no one called the Fed out on this and certainly not Yellen at her quarterly press conferences. Hopefully, someone will question Chairman Powell on this! More than a week ago, I started discussing the idea that a trading range was setting in with modestly lower and higher prices as the range. For a few session, stocks blew right past that idea. Before today, the stock market had very, very quietly pulled back for four sessions without much fanfare except for some weak internal readings. That all changed as a solid employment report with finally some real wage growth further spooked the bond market, sending yields on the 10 year note to 2.85%. There is fear that 3% will be next and that will make bonds more attractive again and give stocks competition. I don’t buy that at all. The issue is not that yields hit 2.85%, but rather that they are doing it in spike fashion. If yields had taken two steps and one step back on their way to 2.85% in orderly and boring fashion, I doubt the stock market would really care. It’s the same thing with oil. When oil either surges or plummets, the stock market usually follows suit. Markets are very good at adjusting and adapting to new levels as long as they get there slowly and orderly. The long, long, long awaited stock market pullback is here. It should be a mid single digit affair and conclude by the end of the quarter. Because of how large the numbers are on the Dow, the point decline will make headlines. But remember, the Dow is down 4% right now and that’s over 1000 points. It’s not the end of the bull market and certainly not the end of the world. Friday selloffs always concern people because they have snowballed in the past. Wherever stocks close on Friday, it is unlikely to mark the final bottom. Dow 25,000 is a logical target. The volatility Genie is out of the bottle and should be the rest of the year. Pullbacks are good to allow you to jettison investments that are lagging or you no longer like to rotate into better performing or higher quality ones. Anyone still talking about the “melt up”?? ?